Private Fredrick Peppernell was reported missing in action on 7 June 1917. Some confusion reigned as to whether he was indeed deceased, or was just missing. His military record contains the following letter, written on 13 September 1917 to his mother in Kerr’s Creek, from a New Zealand soldier “somewhere in France”. It is with regret that I have to write and tell you that your brave son was killed while doing his duty for King and Country. He was burried [sic] with one of his comrades where they fell. I am forwarding the few PCs [postcards] he had in his pocket. Hoping you receive these alright, a brave lad loved and respected by all. From a New Zealander in arms who layed [sic] your son to rest and put a cross and his name and number. Pte HD Edmonds, No 37173 1st Coy 1 CIB NZEF France. At this time the Australian Army still had not confirmed Frederick’s death. It was not until March 1918 that his file was marked “Killed in Action”. F Peppernell was one of three brothers who were all together. It was a rather remarkable story. He was wounded in the advance and his brother got him into a shell hole and then went on. When they returned there was no sign of him and he has never been heard of or seen since. It is a mystery because the Germans could not have got to him there, and my theory is that he staggered away to get back to the dressing station and a shell got him. All my mates think the same. This was at Messines. 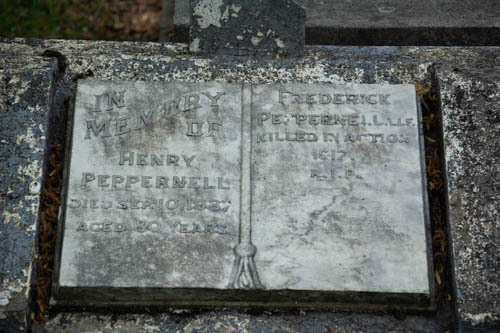 Henry and Annie Peppernell of Kerr’s Creek had given three of their sons to the war effort: Frederick, Henry and William Henry. 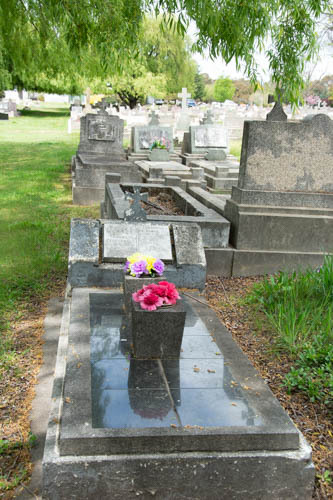 Frederick and Henry were twins, their births registered in Wellington in 1892. The family lived at Kerr’s Creek, between Orange and Wellington, where their father Henry was recorded as a miner. The brothers came of a large family of at least 15 children. Frederick and Henry enlisted together on 17 January 1916 and have consecutive regimental numbers. 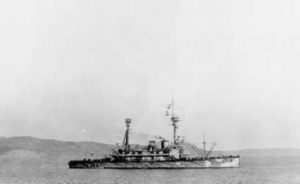 They joined the 36th Battalion, B Company, and embarked from Sydney on board HMAT A72 Beltana on 13 May 1916. Frederick marched into France and on the 8 February 1917 marched out to the front in France. 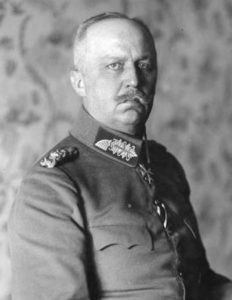 Frederick was killed during the Battle of Messines. Private Frederick Peppernell No 535, 36th Battalion AIF, is remembered on the Kerr’s Creek Honour Roll, on panel number 127 on the Roll of Honour at the Australian War Memorial in Canberra and on panel 25 of the Ypres (Menin Gate) Memorial in Belgium. Frederick is also remembered on a military headstone in the Orange Cemetery next to his parents, Roman Catholic Old Section B, number 786. Both of Frederick’s brothers returned to Australia after the war. Frederick Peppernell commemorative plaque, Orange Cemetery. Image courtesy Lynne Irvine. Frederick Peppernell plaque detail. Image courtesy Lynne Irvine. At 8.30pm on 29 October 1918 Stanley Michael Jordan died at the 3rd Australian General Hospital at Abbeville in France. The cause of death was listed as bronchopneumonia, as the result of exposure to the elements. 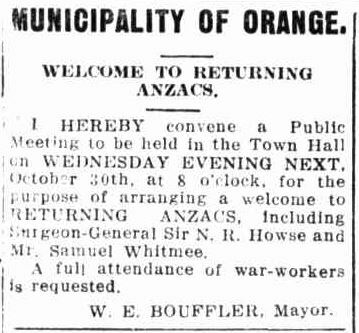 Stanley was the last person from the Orange district to die during the First World War. The armistice was signed just thirteen days later. Stanley was born in Paddington, Sydney, in about 1894. He grew up in Orange, living with his mother in Lords Place and attending Patrician Brothers’ School. Following his education Stan (as he had become known) trained as a hairdresser. 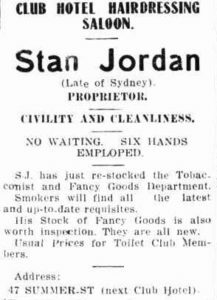 He later moved to Sydney to further his business. In 1916 Stan returned to Orange and opened a hairdressing salon attached to the Club Hotel in Summer Street. In early October 1916 the Commonwealth Government announced that all unmarried able-bodied men between the ages of 21 and 35 were to undertake military training leading to the possibility of service within the Commonwealth. Eligible men were able to appeal to an exemption court, and Stanley did this. 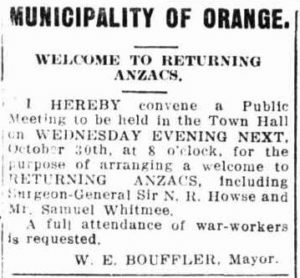 An exemption court opened at Orange Courthouse on 19 October 1916 and was operational until November 1916. Stanley Michael Jordan, hairdresser, urged that he was the sole proprietor of a business, and supported his mother and sister. His only brother had already been called up. He was totally exempted while the conditions remained unaltered. Less than a year later Stanley enlisted in Darwin. He embarked RMS Ormonde in Sydney on 2 March 1918, a private in the 31st Battalion, 15th Reinforcement. 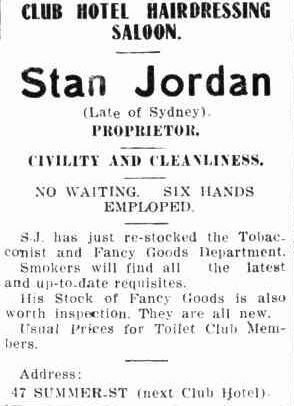 In May 1918 Private Jordan was hospitalised with influenza. 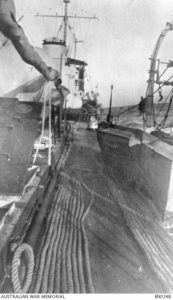 He recovered, undertook further training at the 14th Training Battalion at Codford in England, and proceeded to France in August. On 24 October Stanley was admitted to 8th Australian Field Ambulance with a reoccurrence of influenza. Two days later he was transferred to the 3rd Australian General Hospital at Abbeville, where, on 29 October, he died. Stanley was buried in the Abbeville Communal Cemetery Extension. Stanley Michael Jordan is commemorated on the Patrician Brothers’ Orange Roll of Honour and on panel number 118 on the Roll of Honour at the Australian War Memorial in Canberra. In 2015 Stanley Street in the Darwin suburb of Muirhead was named in his honour. Stanley Michael Jordan dies of disease in France. Stanley is the last person from the Orange district to die before the declaration of armistice. Four other men, however, would die post armistice from war-related injuries or disease. German sailors at Kiel mutiny after hearing that they will be ordered to engage the British fleet in the face of defeat. News of the mutiny spreads throughout Germany and inspires other insurrections. The Czechs declare their independence from Austria. Two days later, Slovakia declares independence from Hungary; Czechoslovakia is subsequently formed. A memorial service was held in Millthorpe at the beginning of September 1918 by Captain Love of the Salvation Army. It was held to honour the life of Private Ernest Richard Larkin Baulch, killed in action in France on 23 August 1918. Ernest enlisted in Orange on 15 February 1917 aged 18 years 5 months, his occupation was given as a farm labourer. He formed part of the 3rd Battalion 24th Reinforcement in the AIF. On 10 May 1917 Ernest embarked on the HMAT Clan Macgillivay at Melbourne bound for England. From there he was taken on strength to France in December of that year. On 10 March 1918 he was admitted to the 2nd Australian Field Ambulance with trench fever. He rejoined his battalion on 1 August 1918 and was killed in action on 23 August 1918. Australian Red Cross Society Wounded and Missing Enquiry Files contain reports of various soldiers who saw him as he fell. He was described as very thin, dark complexion and aged about 19 years. According to Lance-Corporal AA Burton (1065) of the same Company, Baulch “was a well-liked chap, and a really good boy”. He had seen him shot, he was hit in the stomach by machine gun fire about two yards away from him. Burton managed to stop and retrieve Baulch’s pay book, which he later handed in at London. He never saw him again but when he returned to the same area two days later stretcher-bearers pointed out Baulch’s grave near Robert Wood between the villages of Proyart and Chuignes. He was buried alongside another soldier and his rifle and hat were laid on the top of his grave. The deceased soldier was born out of wedlock and his mother, a working girl, could not afford to keep him. I adopted him when he was only a few weeks old. Not being married at the time myself, I called him an adopted brother. He came and lived with me when I married and remained with me until he enlisted. If you would like a copy of the letter I received from the girl giving up all claim to the child I can send it to you. Your brother made great sacrifice of his life during an attack by us upon enemy positions on 23/8/18. We lost him as the result of shell fire during the course of the attack. I can give you the assurance that he did not suffer in any way. Mercifully, his passing was instantaneous and without pain … Your brother has proved himself a good soldier and acceptable comrade. Ern was a good mate of mine. He came across from Australia with me, and I always found him one of the best of mates. In the firing line he did his work fearlessly. Ernest’s memorial plaque, memorial scroll and war medals were signed for by Mrs Jane Warburton on 16 November 1923. Ernest Richard Larkin Baulch has no marked grave. He is commemorated on Millthorpe School Honour Roll, Millthorpe Methodist Church Honour Roll, Millthorpe Memorial Gates, on panel number 35 on the Roll of Honour at the Australian War Memorial in Canberra and at the Australian National Memorial at Villers-Bretonneux in France. General Erich Ludendorff, 1915. Image courtesy German Federal Archives.